Well it’s that time of year, where there are lots of deals that I’d rather buy for myself than for others. I think nothing better encapsulates that than the digital deals going on in the WordPress /online worker space. I mean don’t get me wrong, I’d love to get a great deal on hosting. But I’d be disappointed if someone got me hosting for Christmas. That said, it’s the best time of year to save yourself some money while making those last minute end of the year business purchases. 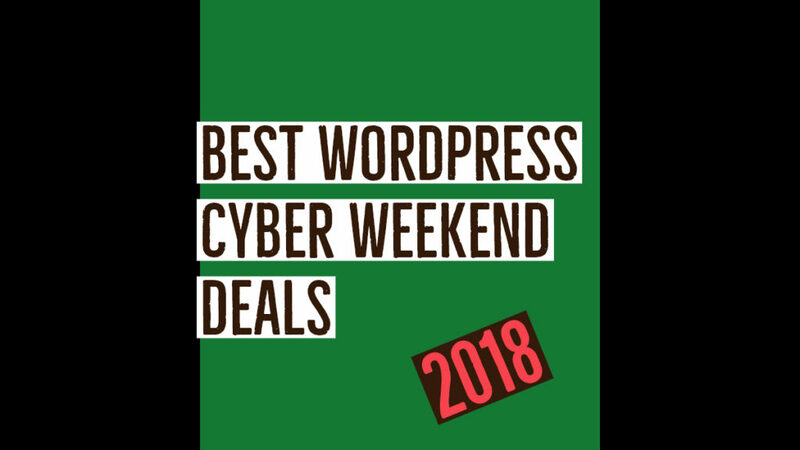 Here are my favorite (mostly) WordPress Cyber Weekend Deals. I’ll also note that I’ve but together what I consider some great gift guides this year. If you need ideas, definitely start there. Finally, many of the tools on sale here are tools I use on this very site. Recently I made an episode of Creator Toolkit where I outline what I use here. Have a listen! OK – on with the deals! StudioPress: My favorite premium theme shop is running 2 deals: Save 20% on all themes the rest of November (here) or Save $100 on the Pro Plus All Themes package through November (here). The second deal is a 20% savings on top of what you save by buying all themes in bulk. That’s over $1000. I have it and strongly recommend it. LifterLMS: Lifter is a widely popular LMS plugin for WordPress. While they offer a free version, you get a ton of stuff with the paid version. They are doing something a little different. From now until Nov. 22, you can save 20% with the code BLACKFRIDAY18. From Black Friday through Cyber Monday, that drops to 15%. So act now! Pathfinder SEO: This fantastic SEO tool that also serves as SEO trainer is giving you 50% off your first 6 months, no through Cyber Monday. Learn more from the founder, Lindsay Halsey on my podcast. Erin Flynn’s Client On-boarding Bundle: Erin’s most popular product, her client on-boarding tools, are currently on sale for 62% off. That’s an insane deal with tons of value. Get it now if you do any client work. WP101: Through the end of November, WP101, the number one learning resource for WordPress, is offering 50% off all memberships with code SAVE50 at checkout. Visit WP101. Timbuk2: Love their bags, love the 50% off deal.